An enthusiastic traveler and photographer Aleš Zajíček who despite multiple sclerosis continues travelling around the world has prepared a calendar for year 2017. Calendar that helps. Proceeds from its purchase goe to the Endowment Fund IMPULS, and therefore to patients with this incurable disease. "Sclerotic Uncle Aleš" probably needs no introduction. With the camera on his neck and the story about living with MS he volunteered last year at the "Seeking for 16 thousand tour" around the Czech republic. He also became one of the faces of our book "Seeking for 16 thousand". Since then he has made several more trips, and with his girlfriend Jana he has visited e.g. the Philippines, Slovenia or Mallorca. Selection of twelve best photographs from many destinations that travelers have visited in recent years can now light up your home or office, or can be a nice gift to your beloved ones. 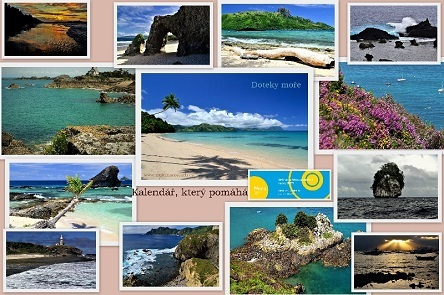 "In the calendar you can find pictures from the Island of Jersey, Fiji, the Philippines and the Normandy coast. We would like to see it becoming a tradition for the future," Mr. Zajíček says. Calendar costs CZK 250 and IMPULS, Endowment Fund recieves proceeds from its sale.